Throughout the world heritage assets are the most accessible, durable and expressive symbols of a country’s history and culture. When historic architecture and archaeology is lost, the stories and societal history that embed in their physical presence are also lost forever. The report by Ulster Architectural Heritage records that over 300 listed buildings at risk have been conserved and removed from the list though the concerted action of a range of stakeholders including: owners; community groups; amenity societies; the UAH and the Historic Environment Division and that the project itself has been of enormous benefit over the years. It also highlights that there is no room for complacency with around 500 assets currently on the list, as improving monitoring and hard economic times will inevitably result in more additions. The report, commenced in 2016, and developed in the intervening period, considers the ongoing threats to the survival and sustainability of Northern Ireland’s historic built environment in the context of the Heritage at Risk NI (HARNI) project, a partnership between the UAH and the Historic Environment Division of the Department for Communities for over 25 years. This latest report focuses on the years 2006-16. It highlights key statistics and trends, considered in the current context of factors affecting heritage at risk in Northern Ireland. The document provides clear recommendations of how issues exposing our heritage assets to risk might be better targeted within the new and evolving structures of local and central government introduced in 2015. Drastic budgetary cuts introduced by the Northern Ireland Executive have seen the Department’s available grant aid provision fall from £4.6 million in 2006 to £500,000 in 2015, amounting to a reduction of in excess of 90% allowing for inflation. 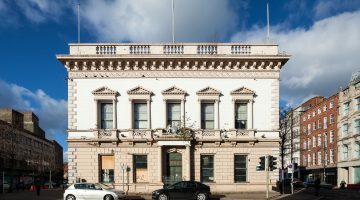 The issue is seen by UAH to be further accentuated by the complete absence of any dedicated indicators or targets for Northern Ireland’s heritage assets in the final draft of the Stormont Programme for Government (PFG) document, which went through public consultation in December 2016, before the current political stalemate. UAH stresses the need for a proactive and future-proofed approach to tackle issues relating to heritage at risk, particularly appropriate, coordinated commitment and action from central and local government in support, funding, application of legislation and enforcement. Fostered by new and strengthened partnership working between UAH, central and local government can assist owners, raise awareness of the economic added value of the asset and save and protect heritage at risk. Such activity requires significantly more investment than currently available despite still representing substantial long-term national benefit for relatively insignificant outlay. A final draft of this report was submitted to the Department in January 2018. In June 2018 the Department announced an open competition seeking proposals for a new Heritage at Risk Northern Ireland (HARNI) partnership. Following evaluation of proposals by the Department, UAH was successful in being selected as the HED delivery partner for the new HARNI programme. 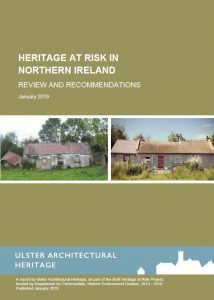 View the full report ‘Heritage at Risk in Northern Ireland: Review & Recommendations’ here. View the Department for Communities, Historic Environment Division response here. Search the Heritage at Risk NI Register here. ‘It is a good time to reflect on the past and contemplate the future as the Heritage at Risk NI project in its various forms celebrated a quarter of a century of achievement in 2018. Over 300 Buildings at Risk have been saved, by way of the hard work of many individuals and groups across Northern Ireland.